Herewith courtesy of the good folks at Sambadabada is the seventies classic by Orlann Divo. Some of you may recognise the tune Ondo Anda A Meu Amor which has cropped up on any number of more recent Brazilian compilations. 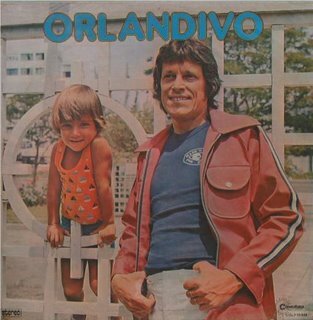 Orlann participated in several films as the soundtrack composer and as an actor both in cinema and TV and had his songs recorded for the first time in 1958: "Vem Pro Samba" and "H2O," by Roberto Carreiras. He was hired by Ed Lincoln in 1960 as the crooner of his group, and in 1961 he recorded a double single which had one of his biggest hits, "Samba Toff." Known for using a bunch of keys as a percussion instrument, in 1962 he launched his first LP, whose title track, "A Chave do Sucesso," made reference to that.